Shinichi Suzuki was a Japanese violinist and teacher born on October 17, 1898 (Stravinsky was 16 years old.) He is remembered for having invented the popular Suzuki Method of music education. He did not have formal instruction at the beginning, however, he taught himself to play by listening to records and imitating what he heard. Suzuki began this course of self-instruction at age 17. He was never a concert violinist or a soloist but he did play with a string quartet for a while. At age 22, he traveled to Germany where he studied with Karl Klingler. When he returned to Japan, he taught at the Imperial School of Music in Tokyo. From teaching many children in the countryside, he developed his teaching methods in the 1940s. He often referred to his methodology as talent education. 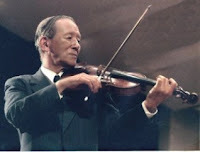 Critics of the Suzuki method have said that pupils who learn through it never learn how to read music well since they become accustomed to playing by ear. Shinichi Suzuki died at his home in Matsumoto, Japan on January 26, 1998, at age 99. As far as I know, only Otto Joachim lived as long.